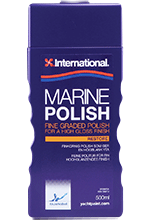 International Marine Polish is an ultra-fine grade polish with wax, for use on gelcoat and paintwork. Gives lasting protection and high gloss. For manual and machine polishing (800-1000 rpm). Free from silicone oils.